Spring is in the air! What a wonderful time to be in Germany...flowers are blooming, days are getting longer, and Eis Tony has made his first appearance on post. I hope you all enjoy this glorious weather during Spring Break, whether you stay home or go off exploring. Check out the Easter Markets, go to the Opel Zoo, or even go for a walk in the woods. This is also the time of year we all dread a bit, PCS season. Hug your friends a little bit tighter as they prepare for this move- no matter how many times they’ve had to pack up their HHGs and embark on their new adventure it doesn't get any easier. Welcome the new families that will start appearing, invite them in for coffee, introduce them to the area, and make room in your hearts for “the new girl”. 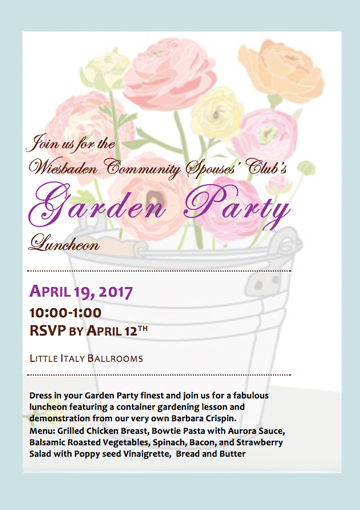 I look forward to seeing all of you in your Garden Party dresses and hats at the April luncheon, please remember to stop by the Thrift Shop and Ways & Means tables to see what they’ve found in their travels to tempt you. This month at the luncheon we will vote for our 2017-2018 Executive Board of Governors, to all those who are nominated I wish you the very best of luck. The strength it takes to step up and “Yes, I will” is daunting for most of us, a bit scary even. Please offer a helping hand and a kind word as you see these ladies learn their new roles over the new few months. 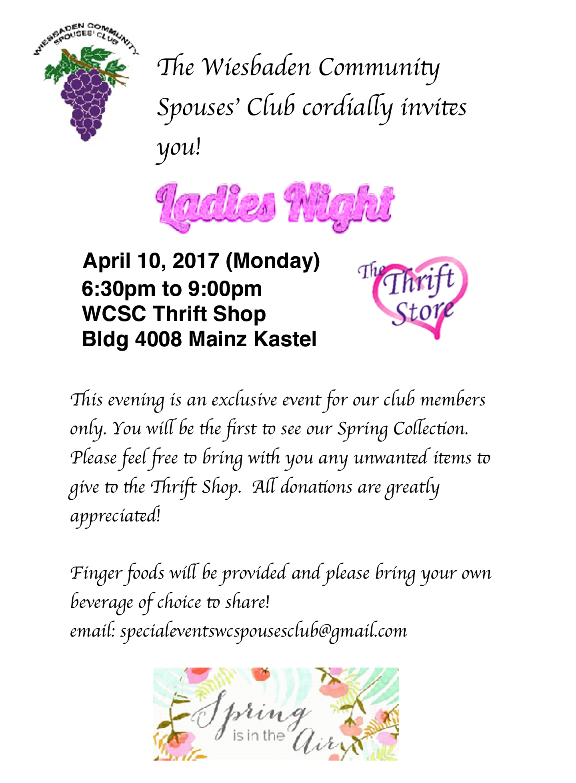 Special Ladies Night event on April 10! All of our members rock and this month we celebrate YOU! 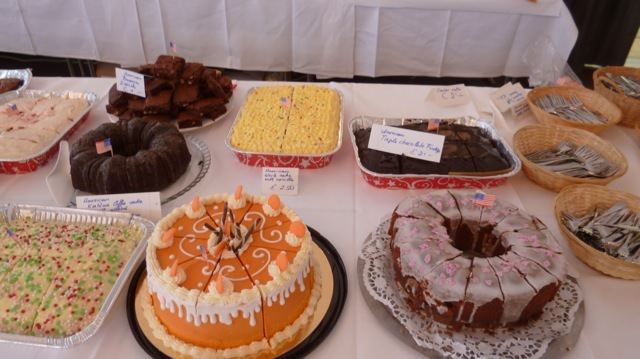 On behalf of the GAIWC, I would like to thank all the fabulous WCSC members who donated baked goods to the annual GAIWC Spring Bazaar last month. Your continued support of this yearly fundraiser was greatly appreciated by the club and by those that purchased your goodies! A BIG thank you goes out to Kimberly Formica and Brandi Collins for opening their homes for the goodies to be dropped off. By the time I reached Kimberly’s home, and loaded up with the cakes that she had, my car was filled! 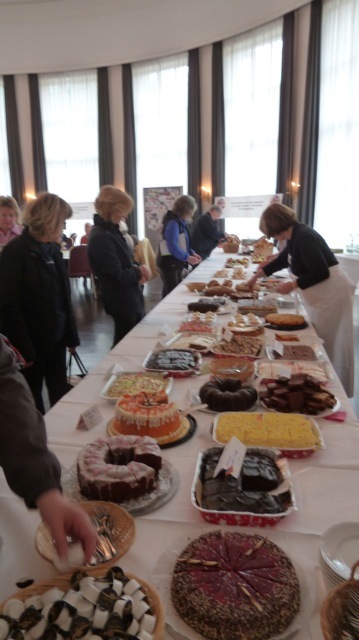 The German ladies were overwhelmed with delight to see all the goodies and could not get over the outpouring of support! Please help! I just learned that my very best friend is moving here this summer!! She keeps asking me about Wiesbaden, and Germany too, of course, and how much I like it? Problem is...I HATE it!! !I moved here last year, didn't want to come, have met no friends, the shopping stinks and my husband works ALL of the time!! Should I tell her the truth? Oh my goodness daaahling!!! There, there now, it'll be fine. Please, please don't tell her that you HATE IT!! For heaven's sake, how terrible gauche!! HATE is such a harsh word! Instead, let's share with her some of the positive and fabulousness of all the activities offered here!! 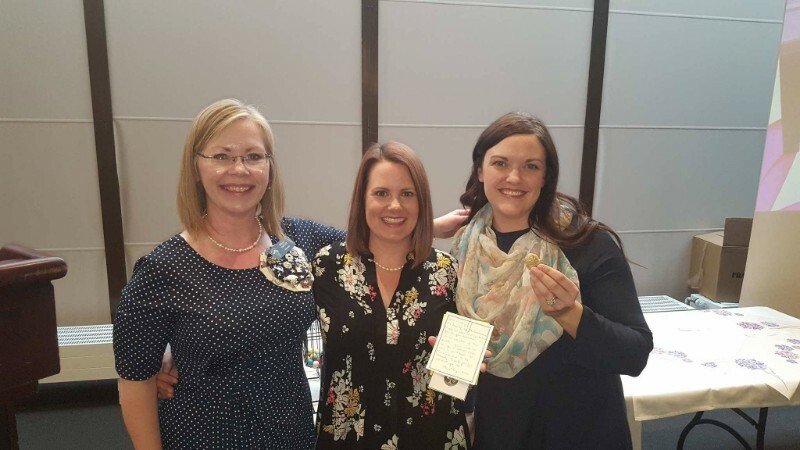 For instance, our very own WCSC, truly such a fun, professional and fabulous organization! We have great schools for our les enfants, wonderful Chapel groups, various interests supported by our Army Community Services, award winning Child and Youth Services, supportive and progressive leadership and INCREDIBLE LOCAL HISTORY (did you know that the pilots who flew the Berlin Airlift, took off from our Flugplatz Erbenheim on Clay Kaserne? The streets of the original kaserne are all named after those valiant pilots!) USAREUR HQs is located here and is the stalwart face of our continued American Military presence for all of Europe! Are you starting to get the idea m'amour? And then, I want you to stop and ask your cute self WHY you HATE it here! Are you involved in anything? Are you a very positive or very negative person to be around? Like it or not, the PEOPLE are what make a PLACE what it is or is not, and there are a LOT of great gals trying their very best to make the experience and time here, the very best it can be. Try getting to know them! Maybe you didn't feel as welcome as you may have expected when you arrived, or maybe you and your neighbors have nothing in common, but daaahling, you just have to move on! Get over it and get on with it love! You're here. It's your home for now and making the best of it will help you, your family and your friend, in adjusting to the changes that you are experiencing and awaiting her! Friends! 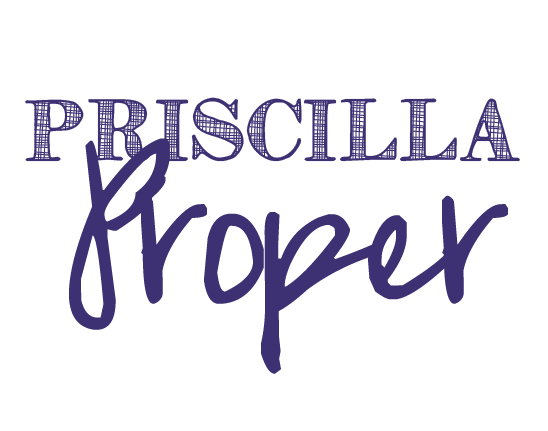 Do you have a question for Priscilla Proper? Email her at prisproper@gmail.com and she will most definitely assist you! Activities will wrap up their year with May's activities. 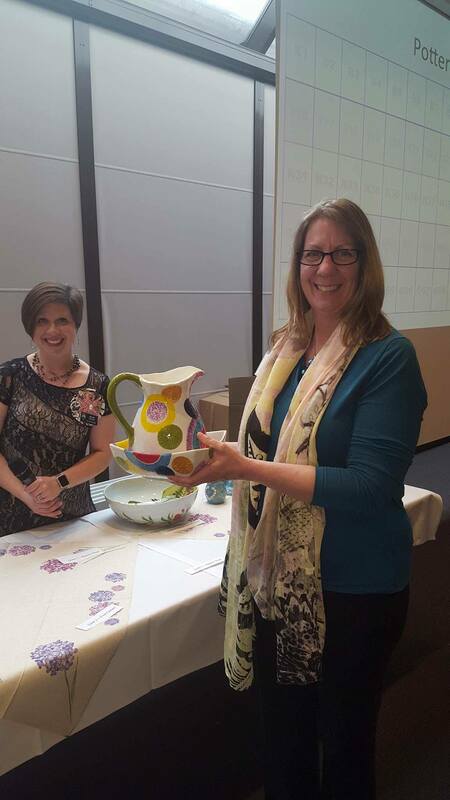 Sign ups for the May activities will open at the April luncheon on the 19th. 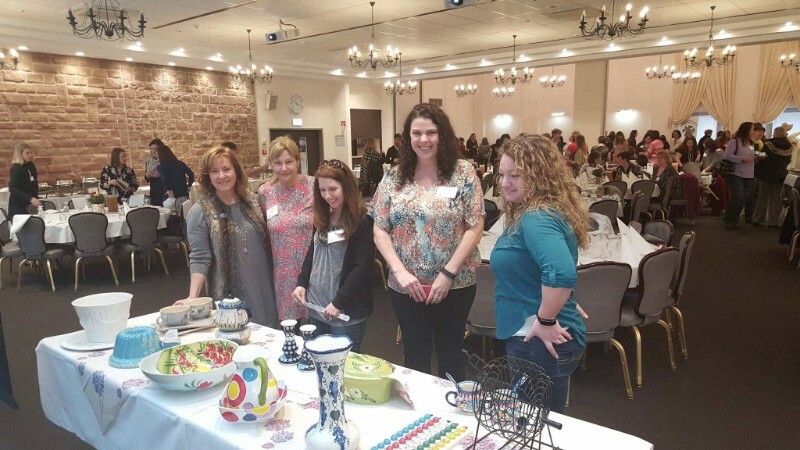 Join the WCSC for our monthly Lunch Bunch. This month we have reservations at Tandoria downtown Wiesbaden. (Wilhelmstrasse 52, Wiesbaden) Meet at the shoppette at 11:30 am to carpool. Enjoy a light lunch while we craft at the WCSC Clubhouse. This month we will be doing a family name sign to hang in your home. It will include your last name with the initial and can include the “established” date in vinyl. Ready for some fresh spargel? Join us on our Spargelhof Experience at Bauer Lipp (40 minute drive) where we will see how spargel is grown and harvested. This activity includes coffee, cake, history and a tour of the facility, spargel picking (keep all you pick), and a delicious lunch that includes water and wine. Bring extra euros for shopping in their farm store. Meet at Hainerberg shoppette at 9:15 am. Join us as we travel to Boleslawiec, Poland, the home of the famous Polish Pottery. We will visit several factory stores, where you will be able to purchase many different kinds of Polish Pottery at great prices. We depart from Hainerberg at 10:00 pm Tuesday, May 9th and travel overnight to Poland. We will arrive bright and early Wednesday morning for breakfast and an entire day of shopping. We return to Wiesbaden at approximately midnight on Wednesday, May 10th. Bring Euro for meals and purchases. Join the WCSC in learning how to cook with Chef Jan. This month’s menu is coming from the country Greece. This menu includes: *If there are any dietary restrictions please let activities know. 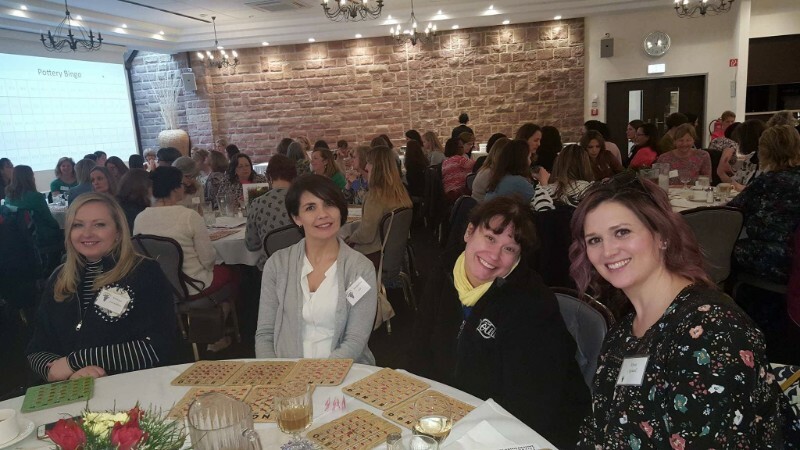 Join the WCSC for our monthly Lunch Bunch. This month we have reservations at Palmyra downtown Wiesbaden. Be swept away to a Middle Eastern Country by enjoying food and atmosphere at Palmyra. The food is awesome and the cocktails are even better. Please meet at the shoppette to carpool by 11:30 am. 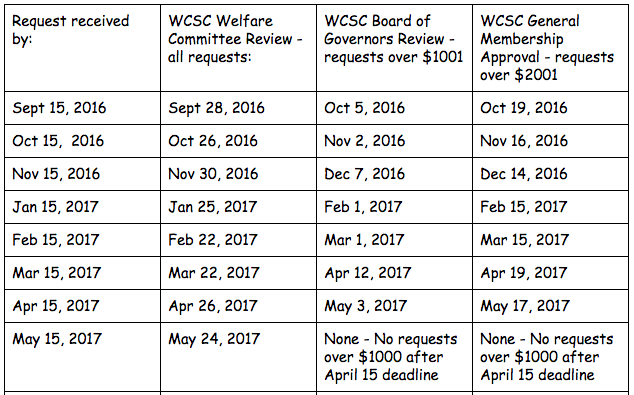 DON’T FORGET THE WCSC CLUBS! Bowling Club: Meet at the WEC (Wiesbaden Entertainment Center) on Hainerberg every 1st and 3rd Monday for some bowling fun and some friendly competition. Please contact Cathy Hanson, cathyhanson2003@yahoo.com, if you are interested in attending. Flohmarkt Club: Visit one of the Sunday Flohmarkts with an expert shopper and find some great deals on some great finds. Please contact Meagan Noranbrock,meagan0813@gmail.com, if you are interested in attending. For the month of March $10,700 and €2,200 for 11 organizations. 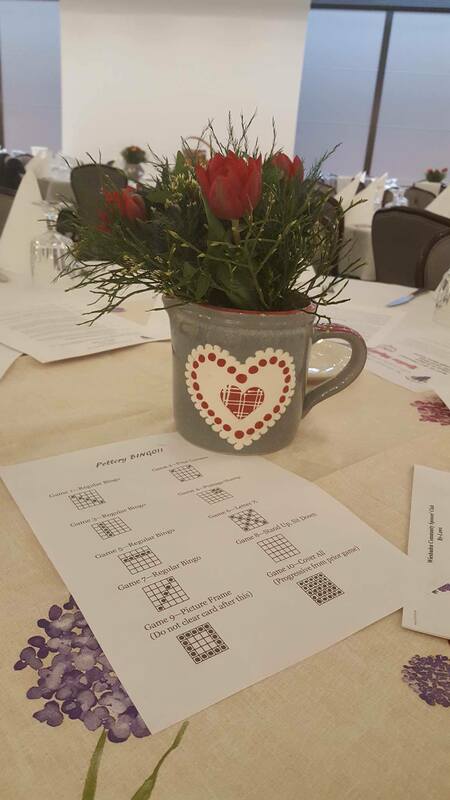 Copyright © 2017 Wiesbaden Community Spouses Club, All rights reserved.